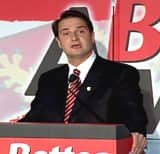 In 2003, Liberal Leader Robert Ghiz came into the provincial election a political neophyte, dragging behind him a battered provincial party and an enormous political legacy. With just one seat in the legislature, the Liberal party was a shadow of what it had been when Robert Ghiz's father Joe was premier of the province. The elder Ghiz won the premiership in 1986, and through two terms made a national name for himself during the constitutional debates of the late 1980s and early 1990s. After wresting government from the Progressive Conservatives, Joe Ghiz built the Liberals into a powerhouse. The party won 30 of 32 seats in 1989, and two months after Ghiz resigned and Catherine Callbeck took over, the March 1993 election left just one Progressive Conservative in the legislature. Come 2003, with Pat Binns seeking a third term in office, it was difficult to focus on Robert Ghiz. The young leader, even now only 33 years old, had only recently emerged into the public spotlight. There was plenty of speculation: could he live up to his family legacy and form a winning team from the tattered remains of the Liberal party? But there was little of Ghiz himself to draw on. Three and a half years later that is no longer the case. The Liberals won four seats in the legislature, including Ghiz's tough victory over a former Charlottetown mayor. It was clear the electorate was ready to "keep building" with the Tories, as that party's campaign slogan said. But it was also clear it was ready to give Robert Ghiz, and the Liberal party, a chance at forming a real opposition. The knocks can be hard in politics, and Ghiz, married less than a year, is finding that it's good to have someone to go home to. It's wonderful to have a partner in life, where at the end of the day, when you go home, you have someone that's there for you unconditionally. Ghiz and his fellow MLAs have been busy keeping the government on its toes, hammering away at the failure of Polar Foods for more than a year, keeping after the government on questions of rural health care, and in perhaps the most dramatic effort of the mandate, simply walking out of the legislature's discussions of the new electoral map, saying elected officials were in conflict of interest making decisions on electoral boundaries. The Liberal party had a rump of an opposition in September 2003, was deep in debt, and its leader was relatively unknown. Robert Ghiz had spent his grade school years watching his father run the province, and went from university to working in Sheila Copps's office, followed by the Prime Minister's Office. These positions certainly would have given him some grounding in the world of politics, but there was no experience of performing in public, or in provincial politics. It was pretty much rebuilding from the ground up, both for the party and for the leader. The party itself has rebounded, paying off its debts, and Ghiz has come through his first term without suffering the youthful, inexperienced implosion that some predicted. At the same time, he hasn't made any visible dents in Pat Binns's armour. Questions about Ghiz's ability to lead remain. He has been unable to keep disputes within his caucus entirely under wraps, and while he has capitalized on government errors, how he would run the government differently will need to be addressed in the coming campaign. Ghiz says he's looking forward to that opportunity. He has found that being leader of the Opposition has not given him many opportunities to discuss policy in a positive way, in a way that is not simply coming out against what the government is saying. "We're looking forward to getting to an election where we're able to present our platform on how we would do things different," he says. "Once we get into an election campaign where we're on equal footing with the governing party... then we're able to offer what our alternatives are, what we would do for the people of Prince Edward Island." On Jan. 9 2009, if Pat Binns is still premier he will have served the longest in that office compared to anyone in Island history. It is Ghiz's job to keep that from happening, and it will not be an easy task. Binns, known for his calm demeanor, gives people little reason to dislike him. It is difficult to defeat an incumbent of more than 10 years who is not actively disliked. It's too early for Ghiz to give away his entire strategy for the campaign, but he has provided glimmers of a strategy that could possibly play to Binns's very popularity. He suggests that the Progressive Conservatives are more interested in being popular than governing well. "It's impossible to please everyone all the time. What you have to do is try to make the best possible decisions for the entire Island population," he says. "No matter what you do there are going to be critics, and you have to accept that and respect that." Asked about issues, Ghiz talks in broad strokes: education, health, environment, and "maintaining our rural communities will be a very, very important issue." It may never come down to meaningful specifics. Facing such a strong, incumbent premier, it seems likely the campaign will focus on two figures, Binns and Ghiz. Ghiz has passed his first political tests, but it's not getting any easier. He now needs to ask Islanders to trust him, to not give Binns a place in the record books, but instead consign his premiership to the history books. Employment: Joined the Prime Minister's Office in 2001 as an adviser for the Atlantic provinces. He also worked for former federal heritage minister Sheila Copps as a special assistant, and for the Bank Of Nova Scotia. Politics: Leader of P.E.I. Opposition since Sep. 29, 2003. Extra: An avid sports fan, Ghiz plays hockey, basketball and golf. Family: Married Dr. Kate Ellis, June 2006. He has one sister, Joanne. Check your riding and see how your district voted. CBC Radio and Television want to read your e-mails live on the air during the broadcast. Tune in live online to CBC Radio One election coverage.